CAO’s La Traviata is about the best thing to happen to cigar smokers on a budget since the invention of the coolidor. I took a look at the original La Traviata earlier this year, and I’ve been enjoying them ever since. 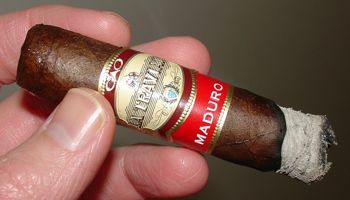 This summer CAO released the maduro version of La Traviata, which employs the same filler blend — a Cameroon binder and filler from Nicaragua and the DR — but uses a Connecticut broadleaf wrapper leaf instead of the tradition Ecuadorian Habano. I grabbed two from a box at the B&M the other day and left in a rush. When I got home I slipped the cello from the sticks and noticed something a little odd: the two robusto-sized Divinos that I had were slightly different shades of dark brownish-black, and one was slightly smaller in ring gauge than the other. Not by much, but noticeably so. La Traviata Maduro is not mentioned on the CAO website, but it’s safe to assume that the size lineup is the same as for the regular Traviata. And looking at my sales receipt, it appears the pricing is similar as well. I started with the lighter and slightly narrower one of the two. The wrapper on this maduro is thick, oily and very toothy. The darker one is especially rich in appearance, but the lighter one is still a highly presentable stick. The roll is solid and the cap is tight. The draw is fairly good — a little loose on one of the sticks, which is why it might have smoked a little hot at the end. The other one was just about perfect though. The ash is solid gray in color and fairly sturdy, though it crumbled a bit in the ashtray. The burn is uneven, which is typical of thick maduro wrapper, but it never required correction or re-lighting. Overall construction: Good to Very Good, with some concerns about consistency. 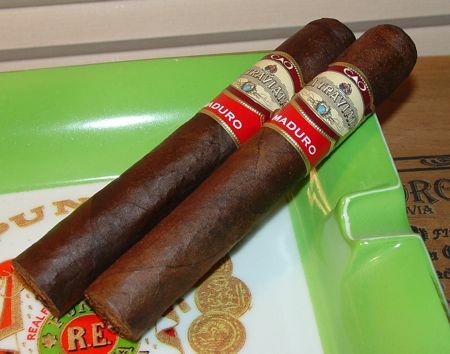 I was surprised at how tame the Maduro version of La Traviata smokes by comparison with the natural version. It starts with a touch of pepper, but that fades pretty quickly until it reappears in the final inch. The primary flavors here are classic maduro: bittersweet chocolate and dark roasted coffee bean. Underneath this is a woody foundation with an earthy touch. The smoke is quite smooth, and not nearly as complex as the natural Traviata. The cigar stays within the standard range of maduro flavors for the duration of the smoke — 35 to 40 minutes — and attempts no major transitions. It’s just a simple, solid smoke. At around five bucks a stick La Traviata doesn’t really need to make a huge splash, and for me it didn’t. But it’s still a solid performer, and there is always room in the humidor for a reliable medium-bodied maduro at this price.